Improve your public speaking for business! Are you maximizing your influence and personal brand? Your expertise has taken you this far. But now you're speaking on bigger stages or to key decision-makers. You need performance coaching to excel in the oral arena—the place where everyone sees and judges who you are. Executive Presentation Skills gives you the tools to excel in this high-visibility role. You’ll be working with internationally recognized speech expert Dr. Gary Genard. Join top management who've received this coaching at multinationals, in healthcare/bio-pharma, finance, government, the United Nations, and emerging technology firms. Your personal program will be customized to your needs, goals, and speaking applications. Learn theater-based techniques that will transform your emotional connection and impact. Be the speaker people believe in. Executive Presentation Skills is offered as short-term instruction or long-term projects at our Greater Boston office or client locations worldwide. All coaching features 1:1 private and confidential sessions with Dr. Genard. Visit this page for corporate and team training. Standard: Eight 75-minute weekly sessions. For Boston-area professionals. Accelerated: Four 2.5-hour sessions. An alternative scheduling option. Intensive: Two 5-hour sessions on consecutive days. From those outside MA or abroad. Presentation Coaching to prepare for a specific event is available on a short-term basis. Following an assessment, activities and assignments will be customized to match your needs and goals. 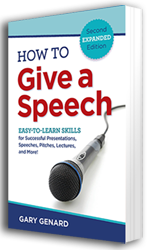 Materials include Dr. Genard’s Executive Speech Coaching Handbook and his books How to Give a Speech and Fearless Speaking. Extensive videotaping of practice presentations with expert critiques and feedback is a core component of this course. Recommendations for continued individual improvement are provided at the end of the course. Follow-up and ongoing learning is available through telephone, Skype, or in-person sessions. You can also continue to learn through Dr. Genard’s blog Speak for Success!, monthly newsletter, videos, free resources on this website and publications. Review and critique by Dr. Genard of your videotaped speech or presentation is also available. Your go-to guide for successful presentations. Now available as an audiobook.